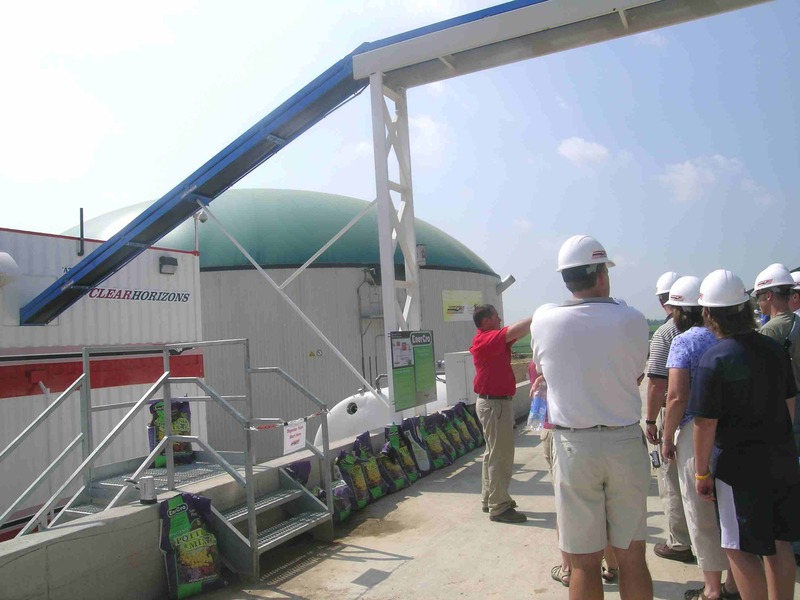 A Clear Horizons' employee (in the red shirt) leads a tour of the biodigester on the Crave Brothers Farm near Waterloo. The bags along the low wall contain potting soil that includes fiberous material left after the digestion process. Michael Vickerman previously addressed the need for higher buy-back rates in two proceedings at the Public Service Commission -- the first in a rate case for Alliant Energy and the second in a WPS rate case. The rate issue ranks high on RENEW's agenda for the next two years. I'm told the following: the world is going green and Wisconsin wants to grow its business base. I believe the former but not the latter, because the Public Service Commission, utilities and some politicians in this state seem to consider both ideas about as important as what cricket team is the current world champion. I proudly admit to having a horse in this race or at least a cow in the shed. PPC Partners Inc. is one of Wisconsin's oldest, largest, employee-owned companies. It has over 1,000 employees throughout the U.S., but primarily in Wisconsin. It was started as Pieper Electric by my father, Julius Pieper, with five employees. We have an entrepreneurial spirit and believe in the creativity of Wisconsin workers. In September, I was told by a group of CEOs that one of our cutting-edge subsidiaries, Clear Horizons LLC, should "locate in California, where you can get things done." We absolutely do not want to relocate this company. We do want Wisconsin to give more than lip service to supporting alternative sources of energy. Here's what Clear Horizons does. Clear Horizons has developed a solution to dairy farm manure disposal that not only reduces greenhouse gas emissions created by methane gas from the manure, but also provides enough alternative fuel from a herd of 750 cows to electrically power 200 homes. The equipment takes the methane and uses it to power engines that generate electricity which can be bought by utilities. A light bulb does not care if the current is produced by cows or coal. . . . The lack of cooperation in this state has caused other companies like Microgy to leave for Texas. GHD, a similar company from Chilton, Wis., is doing work in Idaho and Mexico. Within the last 12 months, the states of California, Arizona and Vermont have passed legislation guaranteeing producers of biogas a minimum payment because those legislators understand America must become more energy independent, as well as reduce need for substations and transmission and subtransmission lines. Jobs? Recent reports state green energy adds jobs. Every MW of biogas installed creates 35 jobs per year. The biogas potential in Wisconsin equates to 14,000 jobs created per year. Currently, utilities have little incentive to promote alternative energy sources. They act according to federal mandates but are not creatively pursuing opportunities. Cleaner air, more jobs; what's not to like? We're here. We're ready. We're necessary to the future of this state. We need some policies. Is anybody listening?